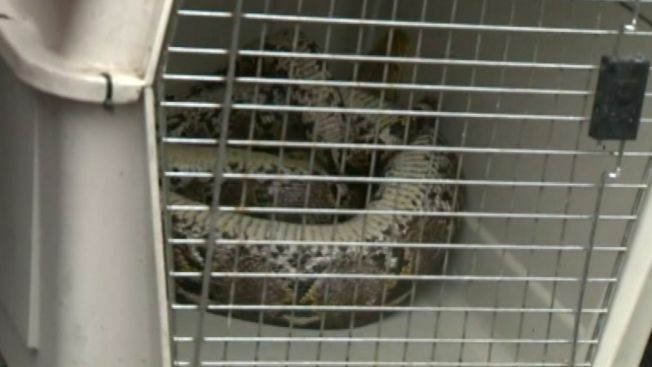 After a tip from an anonymous caller, Houston police raided an apartment and found fifteen snakes packed into two rear bedrooms. An investigation began a month ago when the anonymous caller told police the snakes had been living in inhumane conditions. Investigators noted that most of the snakes appeared to be underfed and one had a broken back. Within the gaggle of snakes were two pythons over eighteen feet long. The police said all of the species found are potentially dangerous. "Under the right circumstances any of them would be dangerous, especially these large ones. I believe they would be capable of killing a person," said Deputy Christine Kendrick-Harris with the Harris County Precinct 1 Constable's Office. Neighbors of the snake owner, Brittany Barrineau, who has owned snakes for fifteen years, said they had no idea she had the dangerous pets until police showed up. Next door neighbor Ysidro Arrizola said, "I'm glad they're gone. I've got a grandson and if he played out in the back yard, just think if one of those things go out of the gate and get out there in the back yard and bite my son or grandson." Barrineau could face animal cruelty charges.